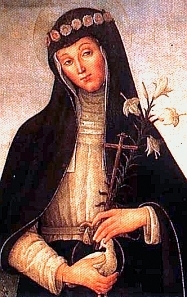 Blessed Colomba of Rieti is always called after her birthplace, though she actually spent the greater part of her life away from it. Her celebrity is based — as it was even in her lifetime — mainly on two things: the highly miraculous nature of her career from its very beginning, and her intense devotion to the Blessed Sacrament. She was one amongst a number of saintly Dominican women who seem to have been expressly raised up by God in protest against, and as a sharp contrast to, the irreligion and immorality prevalent in Italy during the fifteenth and sixteenth centuries. These women, nearly all of the Third Order, had an intense devotion to St. Catherine of Siena, and made it their aim to imitate her as nearly as possible. Many seculars, men as well as women, shared this devotion, amongst these being Ercole I, Duke of Ferrara, who had a deep admiration for Colomba and for some other holy Dominican religious, her contemp oraries, the most notable of whom were Blessed Osanna of Mantua and Blessed Lucy of Narni. For the latter Ercole’s veneration was so great that he never rested until he had got her to come with some of her nuns to live in Ferrara, where he built her a convent and where she died after many troubles. She began when quite a girl to practice austere penances and to subsist almost entirely on the supernatural food of the Holy Eucharist, and continued this for the greater part of her life. At nineteen she joined the Dominican Tertiaries, of whom there were many in town, though still living at home; and she soon won the veneration of her fellow townspeople by her personal holiness as well as by some miracles that she worked. But Colomba was not destined to remain in Rieti. In 1488 she left home and went to Perugia, where the inhabitants received her as a saint, and in the course of time built her the convent of St. Catherine, in which she assembled all the Third Order Dominicanesses, who desired her as superior in spite of her youth. In 1494, when a terrible plague was raging in Perugia, she offered herself as victim for the city. The plague was stayed, but Colomba herself was struck down by the scourge. She recovered only to save her sanctity severely tried by widely spread calumnies, which reached Rome, whence a commission was sent to examine into her life. She was treated for some time as an imposter, and deposed from her office of prioress; but finally her innocence triumphed. In 1495 Alexander VI, having heard of Colomba’s holiness and miracles from his son the Cardinal Caesar Borgia, who had been living in Perugia, went himself to the city and saw her. She is said to have gone into ecstasy at his feet, and also to have boldy told him of all personal sins. The pope was fully satisfied of her great sanctity, and set the seal of approval on her mode of life. In the year of 1499 she was consulted, by authorities who were examining into the manner, concerning the stigmata of Blessed Lucy of Narni, and spoke warmly in favor of their being genuine, and of her admiration for Blessed Lucy’s holiness. Her relics are still venerated at Perugia, and her feast is kept by her order on 20 May.